Texplainer: Has State Spending on Schools Increased? "Texplainer: Has State Spending on Schools Increased?" was first published by The Texas Tribune, a nonprofit, nonpartisan media organization that informs Texans — and engages with them — about public policy, politics, government and statewide issues. 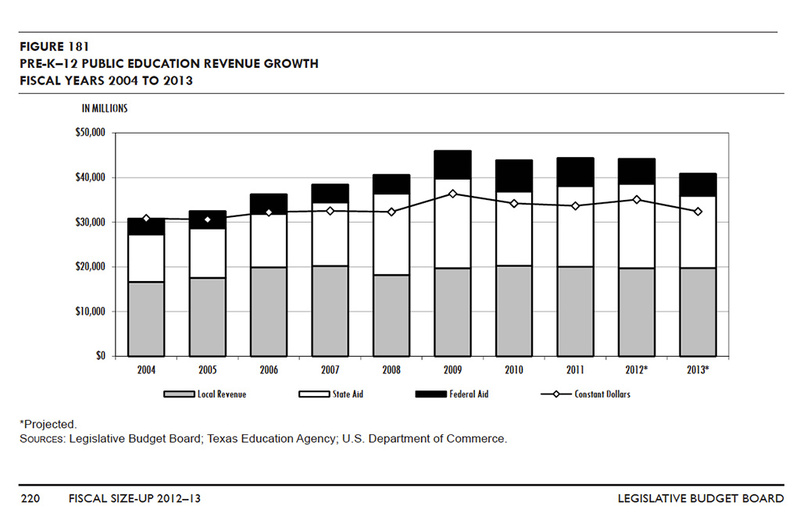 Hey, Texplainer: I keep hearing that the money the state spends on public education has increased over the past decade. But the ruling in the school finance trial said Texas schools are underfunded. Who is right? State district Judge John Dietz declared the Texas school finance system unconstitutional on Monday. He ruled in favor of more than 600 school districts that sued after lawmakers in 2011 slashed $5.4 billion in funding just as the state transitioned to a rigorous new student assessment and accountability system. The state will appeal the ruling, most likely to the Texas Supreme Court, once Dietz issues a more detailed written decision in several weeks. But in responses to Monday’s decision, some groups who criticized the judge's decision argued that the numbers indicate that Texas has dramatically increased its spending over the past decade. “School spending in Texas has grown rapidly over the last decade, with few academic gains to show for it — and we aren’t a step closer to the change that our students, parents and taxpayers need,” said James Golsan, an education analyst with the conservative Texas Public Policy Foundation. But in his remarks from the bench Monday, Dietz said that the state does not adequately fund public schools. He pointed to a chart from the Legislative Budget Board that shows funding for public schools in 2013 is almost the same as in 2003, though enrollment has grown by almost 700,000 students. The LBB chart, reproduced below, shows that state spending in 2003 was about $31 billion in “constant dollars” adjusted for inflation. In 2013, it was slightly above that. That's despite the growth in student population in that decade from 4.3 million to nearly 5 million, according to the Texas Education Agency. All of the data the Texas Public Policy Foundation uses on state education spending come from the comptroller’s office, Golsan said. He said in his statement he was referring to “raw dollars” spent on public education over the past decade, which did not account for inflation. Sullivan said he also based his statement on raw numbers, though his came from the Texas Education Agency. In 2001, he said there were 4 million students in the public education system with about $27 billion spent total, which means the state spent about $6,500 per pupil. Ten years later, the system had grown to almost 5 million students with a total of $55.7 billion spent, or about $11,300 per pupil. Both of those numbers, not adjusted for inflation, reflect state, federal and local spending combined. Texplainer: Has State Spending on Schools Increased? By Morgan Smith February 6, 2013 Hey, Texplainer: I keep hearing that the money the state spends on public education has increased over the past decade. But the ruling in the school finance trial said Texas schools are underfunded. Who is right? State district Judge John Dietz declared the Texas school finance system unconstitutional on Monday. He ruled in favor of more than 600 school districts that sued after lawmakers in 2011 slashed $5.4 billion in funding just as the state transitioned to a rigorous new student assessment and accountability system. The state will appeal the ruling, most likely to the Texas Supreme Court, once Dietz issues a more detailed written decision in several weeks. But in responses to Monday’s decision, some groups who criticized the judge's decision argued that the numbers indicate that Texas has dramatically increased its spending over the past decade. “School spending in Texas has grown rapidly over the last decade, with few academic gains to show for it — and we aren’t a step closer to the change that our students, parents and taxpayers need,” said James Golsan, an education analyst with the conservative Texas Public Policy Foundation. Michael Quinn Sullivan, president of Empower Texans, said that Texas “has doubled per-pupil spending over the last decade, but average test scores have remained flat.” But in his remarks from the bench Monday, Dietz said that the state does not adequately fund public schools. He pointed to a chart from the Legislative Budget Board that shows funding for public schools in 2013 is almost the same as in 2003, though enrollment has grown by almost 700,000 students. The LBB chart, reproduced below, shows that state spending in 2003 was about $31 billion in “constant dollars” adjusted for inflation. In 2013, it was slightly above that. That's despite the growth in student population in that decade from 4.3 million to nearly 5 million, according to the Texas Education Agency. Enlarge Source: Legislative Budget Board All of the data the Texas Public Policy Foundation uses on state education spending come from the comptroller’s office, Golsan said. He said in his statement he was referring to “raw dollars” spent on public education over the past decade, which did not account for inflation. Sullivan said he also based his statement on raw numbers, though his came from the Texas Education Agency. In 2001, he said there were 4 million students in the public education system with about $27 billion spent total, which means the state spent about $6,500 per pupil. Ten years later, the system had grown to almost 5 million students with a total of $55.7 billion spent, or about $11,300 per pupil. Both of those numbers, not adjusted for inflation, reflect state, federal and local spending combined. Bottom line: While the claim that the state has increased spending on public education is technically correct, data from the Legislative Budget Board, which accounts for inflation, shows that state spending has largely flat-lined — even before accounting for the roughly 70,000 students who enter the school system each year. Texas Tribune donors or members may be quoted or mentioned in our stories, or may be the subject of them. For a complete list of contributors, click here. "Texplainer: Has State Spending on Schools Increased?" was first published at by The Texas Tribune, a nonprofit, nonpartisan media organization that informs Texans — and engages with them — about public policy, politics, government and statewide issues. Link back to the original article, which is located at https://www.texastribune.org/2013/02/06/texplainer-has-state-spending-schools-increased/.